Below, I'll list the items I will be putting up on each day. It may change, but not too much. *More Products might be added. MAC 4 Eyeshadow palette- Satin Taupe, beauty Marked, Espresso, Honey Lust. 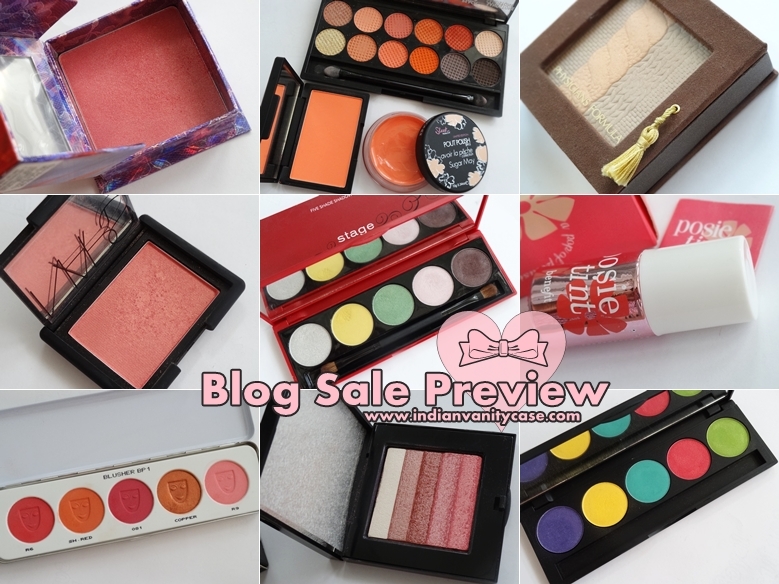 Condition of items: Most of them were used only 2-5 times, some only for review & swatches on the blog. FREE Gifts: Some products will come with a FREE item. Deciding & pairing everything tonight & tomorrow night. Payment to be made through online NEFT Transfer or Cash Deposit. I will email you my bank details, once you've confirmed your purchase. To be made within 48 hours after confirmation. I cannot hold any items for more than 2 days. First come first served basis, no reservations. Please be sure you want to purchase the items, and don't back out later. You just have to comment & tell me what you want to purchase. That item will be marked SOLD asap. The pics posted will show you the exact condition of the products. I will pack them with TLC (tender loving care) in bubble wrap and all, so I will not be held responsible for any damage during transit. All prices listed will be in INR, and are inclusive of shipping costs. I will ship the items within 5 working days, by Speed Post or Courier. I want to ship ALL together in 1 day, as I will be travelling soon. Sale available to INDIA ONLY. And yes, I'm going CRAZY! Sales is NOT my thang- especially online. I wish you could all just come to my house, choose your stuff, and hand me the cash while I'm sitting on the couch doing..... nothing. P.S. I don't/won't sell PR-given items (Come On!) But I might include some with the FREE Gifts, just coz I don't want them to go to waste. haha! I can imagine u being swamped wit emails! oh no.. work gets over at 2.30 for me and i dont even get to use the net at school! Damn! Is it ok if someone else books a product on my behalf? Yes, that could be done, as long as you're sure to buy the item(s). How will you know about the stuff & prices posted then? just trying to figure out how to comment, in preparation for the sale! could you tell me: does the too faced naked palette include the shadow insurance? btw, did i thank u for holding such an amazing sale...well...thanks alot...!! Once you comment "I would like to purchase _______", I'll reply and guide you through the rest. awww!!! !cant wait gonna spend almost everything i have on these stuff!!! !wish i had know earlier !! !would have saved up !! Woot!! I am so totally waiting for this... I want Benefit and Nars. and maybe maybe Nyx. and Inglot. And whatever Else I can fit into my budget. umm....can we lurkers participate?? ?if yes, what details need we provide? yaay.. even i want to buy a few !!!! wow....really lookign fwd to this sale! Cynthia, commenting here as I don't want you to get another email - once you are settled down please do a post on your blogging - I love everything about the way you blog, the quality of pictures, and even your little scrapbook like accessories that you add to the posts. So please for newbies like me tell us the tools to use that can help us improve our own blogs. looking forward for friday sale!!! I don't know how you can bear to let these beauties go but here's hoping I get lucky enough to catch a few! Could you tell me what shade of Inglot blushes you'll be putting up tomorrow? but Cynthia o Cynthia...why at the very month end boohoo..!! Can't wait to get my hands on your drool worthy stuff! Just Practising to comment for this nice sale!! hey where are u cynthia ?? pl make it fast..cant really wait..
if any of u gals have cynthia's mail id..pls mail her and confirm whether the sale is cancelled or not!!! pls!